Home > American Recipes > Grilled Vegetable Pizza — A Summer Stunner! Grilled Vegetable Pizza — A Summer Stunner! Disclosure: “Partnering with Castello for a Summer of Blue“ is a compensated campaign in collaboration with Arla Foods and Honest Cooking Magazine. Herein, all opinions are honest and my own, as always. Grilling? You already know that that’s the type of gal I am! 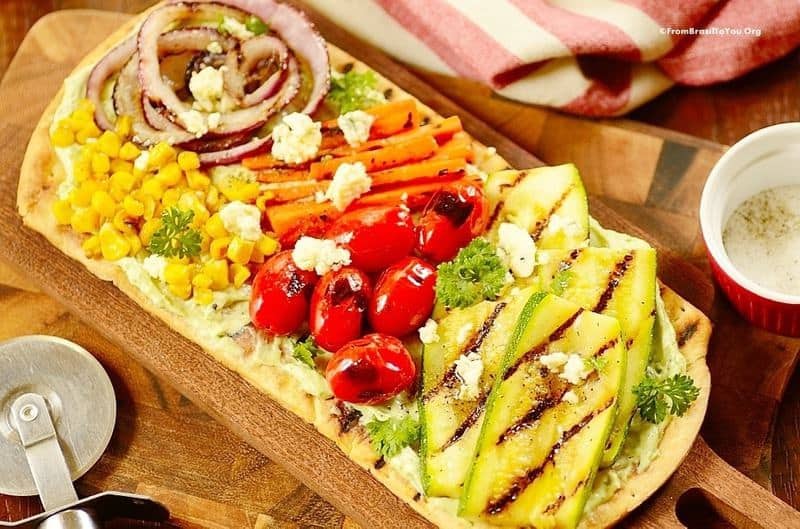 And summer is the best excuse for me and you to prepare all kinds of grilled goodies, including this Grilled Vegetable Pizza. 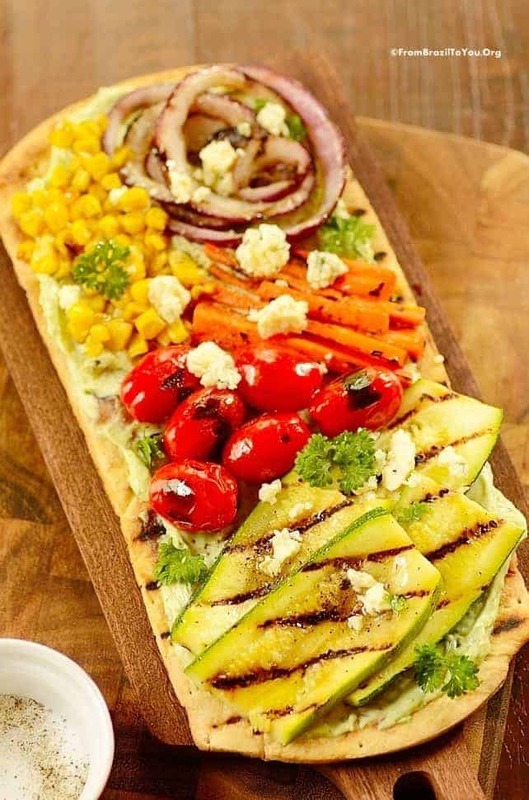 After all, what could be better than a grilled pizza crust and vegetables topped with blue cheese for a delicious summer lunch or dinner? 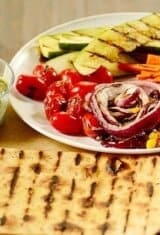 Let me tell you that our grilled vegetable pizza couldn’t be any easier to prepare… All you have to do is to grill a store-bought flatbread, such as pita, along with assorted, sliced vegetables such as zucchini, carrots, corn, onions and tomatoes. Next, top the grilled pizza with our quick blue cheese spread and the grilled vegetables, and then crown it with crumbled blue cheese. And the result? A real stunner, both visually and tastewise. When I say cheese, I am not talking about just any cheese, but an absolutely family favorite–Castello® Traditional Danish Blue… A fine, nutty, blue mould aroma with hints of marzipan and the bitterness of sourdough. In case you didn’t know, Castello Blue Cheeses are epicurean delights. The tangy characteristics are balanced with delicious sweet and salty flavors that are ideal for topping a grilled burger or bringing a complex flavor to summer vegetables. From crumbly, soft, and spreadable blue cheeses, to a sliced variety with floral notes that is perfect for melting, Castello has a wide range of unique blue cheeses. For more information on their cheeses and recipe inspirations, check out Castello’s website. Also take a look at our other Castello recipes: Castello Moments Paignets and Santa’s Breakfast Pouch. 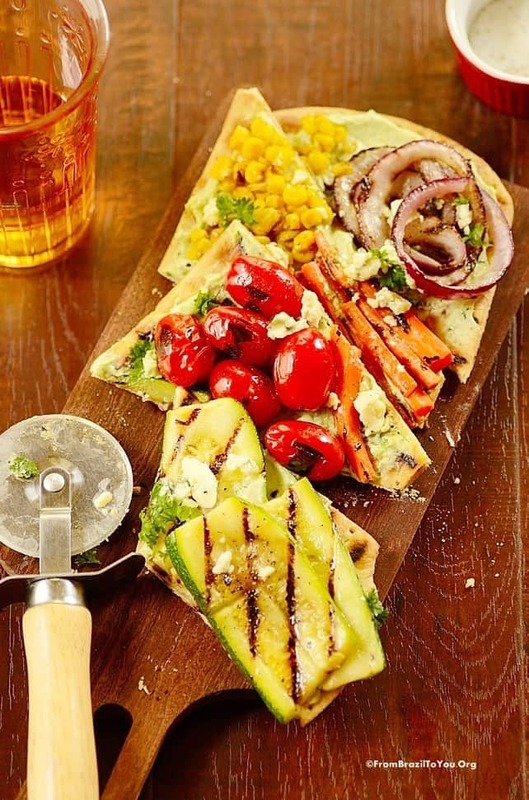 For now, enjoy summer and our tasty Grilled Vegetable Pizza! A colorful and tasty grilled vegetable pizza prepared with store-bought pita bread, assorted vegetables, and both blue cheese spread and crumbs. Start by preparing the cheese spread. Place all of the cheese spread ingredients in a food processor, pulsing well until mixture is homogeneous and fairly smooth. Transfer to a small bowl, cover, and refrigerate. Bring it to room temperature 5-10 minutes prior to spreading on pizza. Then, grill the vegetables. Brush all vegetables with oil. If using a gas or charcoal grill, place brushed vegetables on a grill rack over medium-low heat. If using a griddle like I did, heat griddle over large burner on medium to medium-low heat, brush its surface with oil as well, and then grill vegetables. Times varies from one vegetable to the other. For corn, grill for about 15-20 minutes (grill) or 8-10 minutes (griddle), or until cooked and grill marks appear; cut corn kernels off the cob. For red onions, about 3 minutes per side. For carrots, about 2-3 minutes per side. For zucchini, about 2 minutes per side or until grill marks appear. For grape tomatoes, which can be skewered or not, approximately 1-1/2 to 2 minutes per side, or just until grilled marks appear. Of course, you can replace any of these vegetables, customizing according to your preference. 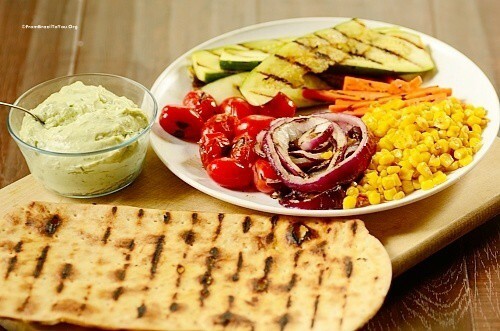 Place all grilled vegetables in a platter and cover. Finally, brush pitas with oil on both sides and grill for about 1-2 minutes per side or just until warm and grill marks appear. 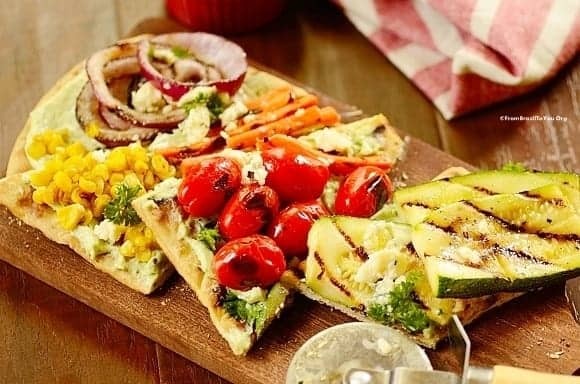 To assemble the grilled vegetable pizza: Lay both grilled breads on a surface, spread cheese spread on both, arrange grilled vegetables on top, sprinkle salt and pepper, drizzle on a bit of olive oil if desired, and then place a bit of the blue cheese crumbs on top. Enjoy! Although I think this grilled vegetable pizza doesn't need anything else, you are welcome to add grilled pieces of meat to it as well as any other vegetable that you wish. 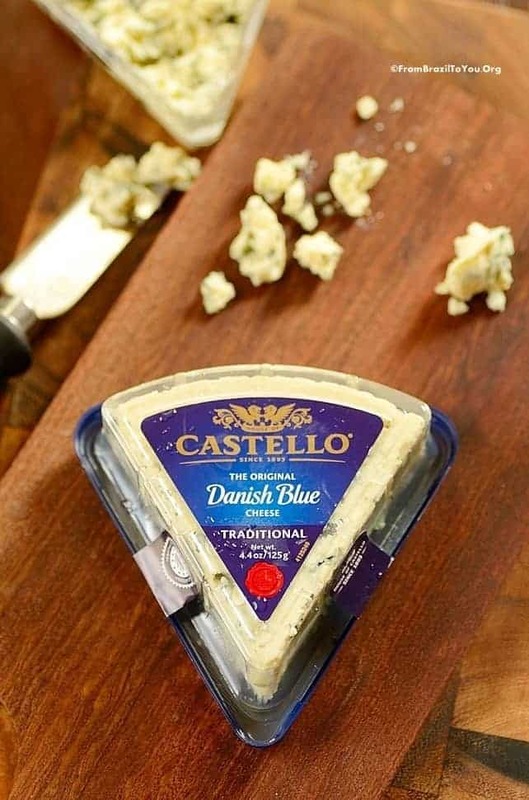 Castello® Traditional Danish Blue is available at several local supermarkets and also major chains. 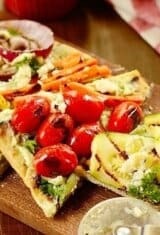 Denise – I love this simple grilled veggie pizza – that Castello cheese spread sounds so good! What a stunning pizza! Everything summer and grilled too! A perfect recipe for this weekend! This sounds wonderful Denise. I would not have thought of a blue cheese spread as a pizza base but it’s a great idea! Love all those yummy grilled veggies too! 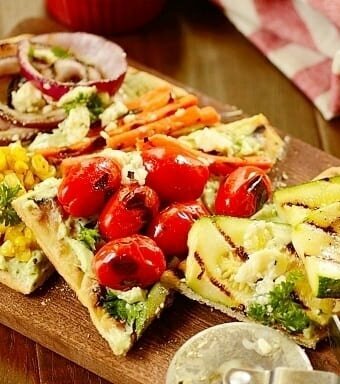 Ohhh…what a great idea making pizza with grilled vegetable!!! Love the idea of using flatbread as a pizza crust! And it’s perfect for grilling. This is a wonderful looking pizza — love the flavors. Thanks so much. Many thanks for the fresh and fabulous idea. God bless. 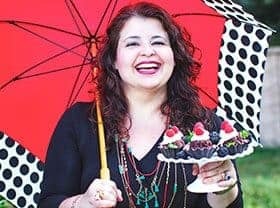 May you continue to sooth my soul with your soulful recipes. Nusrat, my dear, thank you so much. What a kind comment. It’s always good to hear from you! Thank you for the simple, delicious idea dear Denise!